A great add-on to any indoor climbing toy. These Interlocking Foam Safety Playmats for Toddlers are a great add-on to any indoor climbing toy. The areas around toddler slides and climbing frames can be made safe for landing with these adaptable thick soft-foam pieces. They’re great for providing a safe play area for all “on the floor” activities. These playmats for toddlers are ¾ inch thick and provide protection for your kids and your home. Nowadays many homes have hard wooden or tiled floors which are not very toddler friendly. I think it’s dreadful that hard floors like these also discourage Granddads from getting down on their knees to join in the fun. So I am a big fan of these safety playmats too! 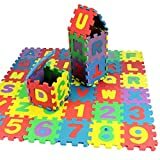 Besides protecting your children from the floor these interlocking play mats also protect your flooring from your kids’ knocks, scratches and even artwork . These foam safety playmats are cleverly designed. The edge of each individual mat has dovetail pieces which interlock with the mat placed next to it. This ensures the play mats stay locked together without any protruding fixing which kids could trip over. You can arrange the mats in the layout that suits you best. As these playmats are made from foam they are lightweight and very durable. They are also waterproof and easy to wipe clean. Every Mom knows how essential that is. Let’s do the math. Each mat is two feet by two feet – four square feet. There are four interlocking playmats in a pack – that’s 16 square feet of safety playmat in total. At the end of play the playing surface can be quickly broken up and the pile of foam safety mats can be easily stored away. As well as being a great safety accessory for your child these toddler interlocking safety mats offer opportunities for creative and imaginative play – as well as some math! – which is forty feet long!. Used three dimensionally these interlocking foam safety playmats can be made into boxes, houses and even tunnels. Step 2’s interlocking safety mats are the perfect accessory to any toddler climbing toy, safeguarding your kids and your home . They’re good value and will certainly protect your kids from those bumps and crashes that fill a toddler’s life. 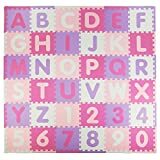 SoftTiles Safari Animals Premium Interlocking Foam Mat Large Children's Playmat Pink and White 78" x 78"
Prices are accurate as of April 25, 2019 11:27 pm. Product prices and available are subject to change. Any price and availablility information displayed on Amazon.com at the time of purchase will apply to the purchase of any products.